The holiday season is quickly approaching! A time of travel, food, family, friends, and of course holiday shopping. If you pick up a shiny new laptop or gadget, don’t forget to install and set up all the free or discounted software, services, and solutions that OIT provides to students, faculty, and staff. Don’t pick up a copy of Microsoft Office on your way out of the electronics store. 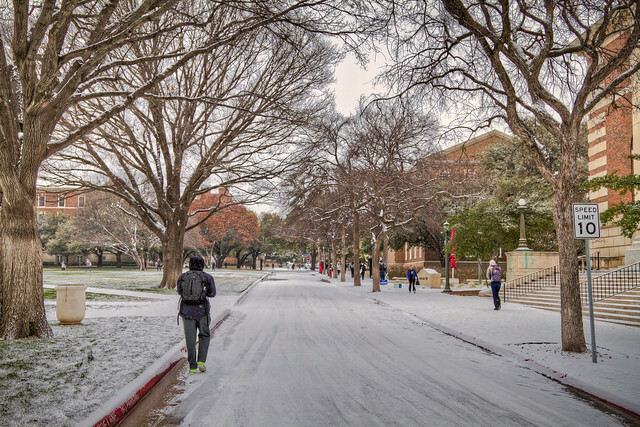 Instead, stop by office.smu.edu, then log in and download Office for free! You can install it on up to ten computers and is totally free as long as you are an active student, faculty, or staff member. Also included is OneDrive, which provides a huge amount of cloud storage for all that homework. Ever since Adobe switched to a subscription-based model for their products, it might be difficult to justify the monthly fee. Thankfully, students and employees alike can get steep discounts on Creative Cloud subscriptions. 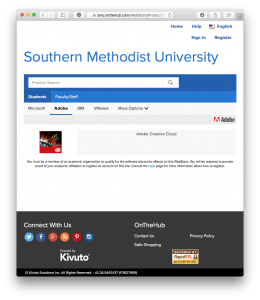 Just go to our software provider at smu.onthehub.com and purchase your subscription there for a lower rate. This suite includes a huge library of the most popular Adobe software, including Photoshop, Premiere, InDesign, Acrobat, and more. There are several more software titles available at a discount, too. Is there a software program that you need for class but don’t want to pay for something you may not use after the class is over? Take a look at our software license page for all the different software that you can install on your computer. Some programs are only available for faculty/staff, and some are available to all. With all of our smartphones, tablets, and hotspots, cell service can get really expensive. If your bill is getting out of control, look into getting a student or faculty/staff discount on your service! Both Sprint and AT&T have discounts available. When you return to campus with that brand-new game console or other device and it won’t connect to PerunaNet, make sure to register it on our guest network so you can get playing! You will need your device’s MAC address, so consult your device’s manual for info on how to get that. Then go to the registration page and enter the device’s info. 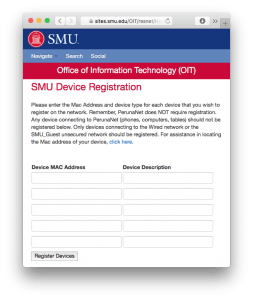 Once registered, you can then connect to the network via Ethernet or wirelessly on SMU_Guest. As always, if you need a helping hand with downloading your software or setting up that console, let our Help Desk know at 214-768-4357 or at help@smu.edu. Also, if you need help with that new gadget, search through Lynda.com to see if there is a tutorial on how to get started! Previous Previous post: Phishing Alert: Protect Yourself!